What Is An Alcohol Overdose? A person who drinks too much and passes out increases his or her risk of asphyxiation from vomiting. Alcohol affects the nerves that control breathing and the gag reflex and excessive alcohol stops these functions. Any alcohol consumed before passing out continues to circulate in the bloodstream. 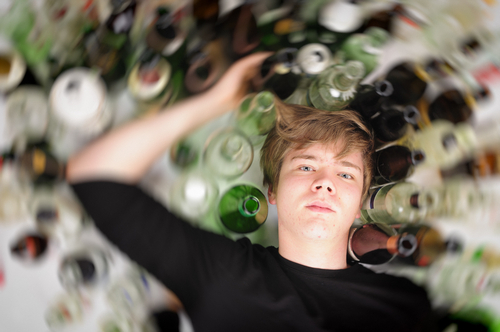 Some signs of alcohol overdose are slowed breathing, seizures, confusion, vomiting, and low body temperature. An alcohol overdose can lead to permanent brain damage. Binge drinking, which is popular among college students, can be fatal, even without the person losing consciousness. Those at risk of alcohol overdose are people who struggle with alcoholism, college students, and those who take medication. Consuming alcohol and taking opioids or sedatives increase the risk of an overdose or serious health complication. Drinking alcohol while taking over the counter medicine can also be dangerous. Pain relievers and alcohol are a very toxic combination. Both are dangerous alone, but alcohol and opioids suppress areas in the brain that control breathing and could result in asphyxiation. When the brain stops receiving oxygen, the person is at high risk of irreversible brain damage. Alcohol poisoning is life threatening and requires urgent medical treatment. If your friend or loved one is drinking too much and exhibiting the signs of alcohol overdose, do not be afraid to seek help. He or she might be angry with you, but ultimately you can save a life.